BELIZE CITY, Mon. Aug. 24, 2015–A 16-year-old who, along with two other men, allegedly was lay-waiting an intended victim around 8:45 p.m. last Thursday, is now in a critical condition at the Karl Heusner Memorial Hospital after he inadvertently was shot in the abdomen by his partner in crime while in them ambush position, according to police. 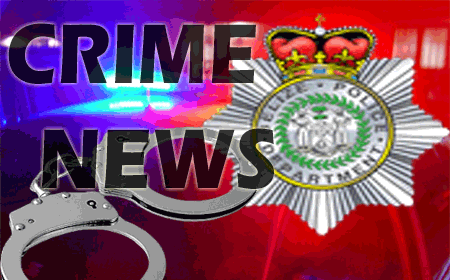 Police say that the three men went into the Queen’s Square Anglican Primary School compound on Fairweather Street on Thursday night and took up ambush positions to shoot a man who was to come over the Fairweather Street Bridge and onto Fairweather Street, near the school compound. As the unsuspecting, intended victim was approaching, one of the three men took out a .38 Special revolver to shoot the victim, but the gun misfired, and he began to tamper with it. According to police, the revolver then fired a round which hit the man’s accomplice, the 16-year-old, in the stomach. The two men ran out of the area, leaving the boy, who was taken to the Karl Heusner Memorial Hospital by people who were in the area. The unsuspecting victim escaped unhurt. A police investigation led to two men suspected to be the would-be killers, who were arrested. The 16-year-old is in the hospital under police guard, and when he is released, he will be charged with aggravated assault with a firearm, according to Sr. Supt. Chester Williams at a press brief on Friday at the Racoon Street Police Station. That is the same charge for which the other two men, Lloyd Leslie, 23, and Dwayne Evelyn, 25, have been remanded to prison today, Monday. Williams, Commanding Officer of Eastern Division South, explained that in order for them to charge the boy’s accomplice for shooting him, the boy must give a statement to police, but it is unlikely that he will make such a statement against his partner-in-crime. Williams said that the 16-year-old is a known George Street gang member who has been charged several times before. Williams said that the would-be victim was not known to police, and that it was his relative who apparently has a problem with the ambushers, or they, with him. Four of the boy’s family members, however, told Amandala today that they strongly reject the police version of the shooting, and said that the charging of the three men is bogus, because the three men were the victims. They had been standing in the school compound when a gunman jumped over the fence and fired at them, and they ran, the family member said. Three shots were fired, and the first shot hit the boy in the back as he scrambled for cover, and two more shots were fired, they said. They also strongly denied that the three men had guns and were waiting to shoot or kill anyone. Kayla Sutherland, the teenager’s aunt, told Amandala that she was with the boy at her home near the Queen’s Square Anglican School at about 8:45 Friday night, and he asked her to go with him to buy chicken. She explained that he had just come out of boot camp and was not allowed to be on the street without an adult after 6:00 at night. She couldn’t go because she had her daughter with her, and at the same time, her neighbor, his friend, who is over 18, came up and he went with the boy to buy food. The boy and his companion stopped and talked to another man in the school compound when a shot rang out, Sutherland said, and the young men ran. Sutherland said that she saw the two youths running towards her and she went towards them to find out what had happened, and that was when she saw her nephew holding his back and he said that he had been shot. Two more shots then rang out, and people ran for cover. Sutherland afterwards saw her nephew on a motorcycle being taken to the hospital by Joe Nunez, a Municipal Court prosecutor who lives in the area. According to Sutherland, her wounded nephew had explained to her that he and his companion had stopped and talked to a man in the school compound when they saw a man come into the compound, from over the fence, and he took out a gun and cocked it, and they ran, but the man fired a shot at them and he was hit in the back. The youth said that he had intended to run to a friend who lives on the same street for help, but he instead went to the home of Joe Nunez, who also lives on the same street, for help, and that was when the two other shots rang out. Sutherland and Keisha Milligan, another family member of the 16-year-old, said that the gunman was heard yelling at the men that they would die. Milligan said that three shots were fired and when the police came, they did not circle the area to find the shooter. She also said that if the youth’s accomplice had been tampering with a gun, it would have discharged into the youth’s leg or foot, but not into his back. He was shot in the back, she said, because he was running away. Sutherland said that they want charges against her nephew and his two friends withdrawn, because they were the victims of the gunman. She said that sending innocent men to prison will not help the peace effort that the police are presently conducting.